for the bike section I used the same bike I had cycled on from Amsterdam, the only modification I did to the bike was to change the tires, put on a pair of race slicks. I made a double breakfast of bacon and egg, and oatmeal porridge with mango. Jumped on my bike to ride 25 km to the Stockholm triathlon venue from my families cottage, I got down to the main road when I got my first puncture, I fixed it and continue on my way. I got as far as Älta when I had my 2nd puncture, I think the main problem that I had was to get the enough air in the tires with a hand pump, I got my last inner tube on the wheel, hand pumped it to get the tire as hard as I could, I was now running late – from Älta I had to bike in race speed to get to the start of the Stockholm Triathlon, the tire held up, no more punctures, got to the start with 10 minutes to spare. It was a long line at the check in, I managed to get ahead and had 5 minutes to spare before my start at 8:00, I got my stuff set up in the transition area, put on my wetsuit while heading to the swim start in the water outside Stockholm City Hall. When I got there, I decide I check with the starter if I start with another group, the answer was yes. That gave me time to go back to my cycle, borrow a pump to make the tires rock solid hard for the race, I got time to warm up. I started in the group that went at 8:40 – I started my swim – I crawled for about 200 meters tills I shifted to a breast stroke, I could feel my lack of not being able to practice swimming. Got around the swimming course, out of the water to the transition area, took my sweet time, had a drink at the refreshment stand. Got the wetsuit off, grab my bike and headed out of the transition area, it was a long transition area, finally I got to the point where I could mount my bike. Started the race, felt good, got to the first climb of Västerbron, felt good – got down to Söder Mälarstrand – got good speed along the Söder Mälarstrand tills hitting Slussen, and kept the speed up tills the turning point at Stockholm City Hall. We had to do 3 laps total of 40 km, on the 2nd lap I start feeling fatigue climbing Västerbron, I still had power on the flats along Söder Mälarstrand, I was tiring fast, when time to transition from bike to running, I was tired. Had to navigate the transition area, got my running shoes on and took of on my 10km run, the run went through Stockholm old town, we had to run Slottsbacken 4 times and run along Stora Nygatan and go around the Royal Castle. 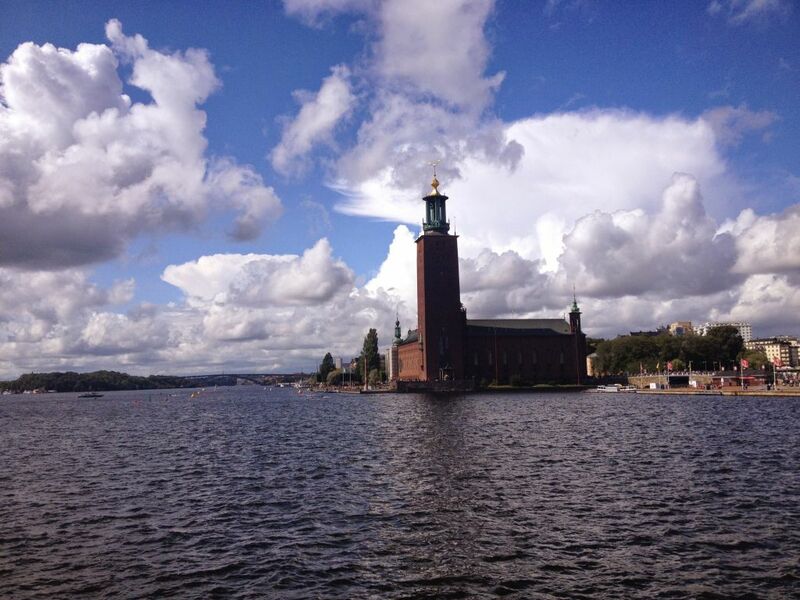 The finishing of the Stockholm Triathlon is spectacular on top of Slottsbacken near the Stockholm Cathedral. My run was a hard one with could not go at my full speed as I had cramp symptoms in my lower back throughout the run. I crossed the finish line a happy man, as this was my 2nd attempt to complete Stockholm triathlon, the first attempt was back in 2012 when my bike broke during the race, so i did not finished. I got my medal now for completing, so I’m very happy. Stockholm Triathlon is my favorite venue for a triathlon, here is some selected pictures from the event. Very interesting inreading and also the photos are fantastic. Goodluck for you in future also.It is all the results from your hard work..Keep it up. Thanks Dan, Stockholm is a nice town to visit. If you are into Triathlon – Stockholms Triathlon has one of the best sceneries of any triathlon course I been to – most of the race is in and around the old town, with the finish at the top of the Slottsbacken hill next to the Royal Palace in Stockholm.On the same weekend that I was there racing – the ITU World Series stop in and I watched Brownlee brothers race. Great inspiration for us mortals.